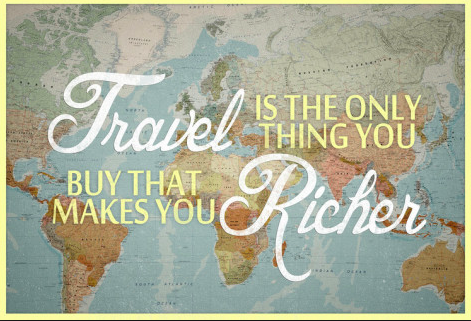 Traveling can be expensive – flights, hotels, transportation, food, activities, souvenirs, it all adds up. But should that be an excuse? Absolutely not. I am 18 and have been able to study abroad in Sweden, travel Europe, and spend a summer in Sri Lanka. Were these trips all paid for by my parents? Absolutely not. I work hard to be able to follow my dreams. Ever since I was 15 I have had a steady job in the catering industry as well as multiple nannying gigs. It was not always easy to sacrifice football games and parties so I could work a 30 hour weekend, but in the end it was always worth it. Having a job at such a young age taught me so much about responsibility. How important it is to be on time, be organized, and have your priorities straight. Being a high schooler living under my parents roof I had virtually no expenses. I did not have to pay for food, rent, electricity, etc, making it the perfect time to save, save, save! While my friends were out buying clothes, fast food, and all the other pointless things teenagers love to throw their money at, I was busy saving and planning my next adventure. Thats the thing I love about travel – it gives you something to work for. Knowing that my money is going toward something I love makes working the long hours seem more bearable. That is another reason why I am glad my parents believed in making me pay for some of my travels – they become more meaningful when it is you hard earned money being spent. All of that being said, I am very fortunate in the fact that my family has been very generous. My grandparents, aunts and uncles, and parents have all been so supportive of my travels. From helping to pay for tickets, to gift cards, and amazing soundproof headphones – They will never know just how much I appreciate their contributions in making my dreams a reality. The point I am trying to get across is that I can travel, not because I am rich, not because my parents pay for everything, but because I work hard. Yes, I have been lucky enough to have an amazing family who help me out, but I also make many sacrifices, so in the end I can do what I love most. I choose to save my money, I choose to have multiple jobs, I choose to give up my weekends – we all have the choice, the hard part is committing.